Thin, flexible crowns can be cut, formed, bent, and pressed without breaking or tearing. May be cemented with any resin or zinc oxide cement. Contains: 4 ea. of 40 sizes, plus 40 crowns on mold guide. Contains: 3 ea. of 50 sizes, plus 50 crowns on mold guide. Contains: 2 ea. of 60 sizes, plus 60 crowns on mold guide. Contains: 2 ea. of 20 bicuspid sizes and 2 ea. of 40 molar sizes. Contains: 20 sizes, 3 or 4 crowns each size. Contains: 40 crowns (1 each size). 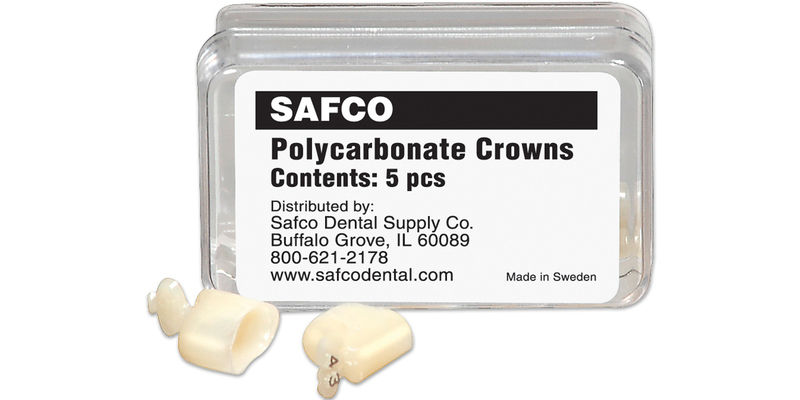 Molar crown sizes are not available as individual refills.